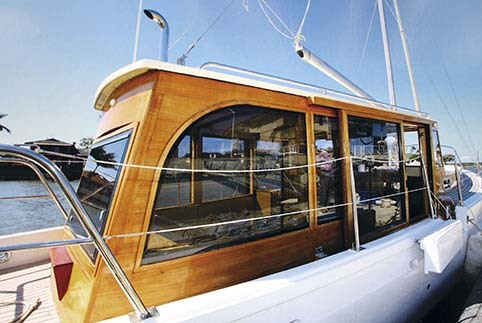 This classic timber hull is a work of passion that’s ready for the South Pacific. If you’re one of those few who can appreciate the man hours, money and madness that go into handcrafted projects, you’ll understand the labour of love behind this beautiful 1923 Tasmanian crayfishing vessel, now a modified motorsailer. This boat is for sale. Find our more information here. 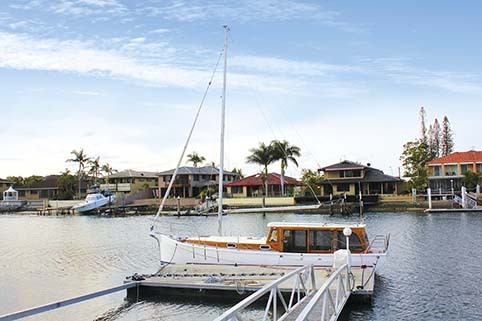 Originally built by iconic wooden boatbuilders, Jacks of Launceston, Nabuka is currently located on a private mooring at Runaway Bay on the Gold Coast. After spending most of her days as a crayfishing boat, she circumnavigated Australia twice over a period of years, even fishing in New Guinea waters before resting in Port Douglas. Current owner and dedicated sailor of 50 years, Barney Steven, purchased Nabuka three years ago with the intention of restoring her to her former 36ft of glory. But this project of passion soon went beyond a simple restoration, resulting in a completely new lease on life as a motorsailer. "She has a marvellous pedigree," says Barney, who consulted the Tasmanian Maritime Museum and the Tasmania State Archives office as part of his extensive research, and has proudly collated an album full of clippings, photos and documents on her past. He was up for the challenge to restore her to a new and beautiful boat even if it did cost $360,000 to do so. The Huon Pine hull was in perfect condition, enabling the wet well to be plugged during conversion to provide plenty of room for the berths and ample storage space. The helm station is fitted with a traditional timber wheel and Simrad electronics and the 1955 four-cylinder Ford Lees diesel engine has been fully reconditioned by Donnelly Engineering in Brisbane just a few months ago and is easily accessed through a large hatch in the helm floor. From the helm, the salon tapers to a narrow stern with large wraparound windows, similar to the gondolas that explore the canals of Vienna. The u-shaped dinette with polished timber table sits under the leather-upholstered ceiling and LED lights, creating an intimate setting. However, don’t let the soft lines of her hull set the course; she is extremely practical in heavy seas and the windows are armourplate glass for extra reinforcement. Every piece of Queensland silver ash paneling and red cedar trim was worked and inserted with precision. All seating is covered in marine grade suede, and cupboards lined with felt. The lower deck opens up to reveal a neat and well-equipped galley to starboard with induction stove and microwave, 240lt fridge and plenty of bench space., plus a 5KVA Onan generator. The galley seating and table to port makes meal time convenient and converts into a double bed if required. Air-conditioned comfort flows throughout the boat from three zones, while the bathroom positioned aft has a simplistic and functional layout, fitted with quality fixtures. Forward is the main cabin with flexible sleeping options converting from two singles into a double. A moveable flatscreen TV can be viewed from bed or the galley. She paces at a pleasurable six knots and has the capacity to hold 250lt of fuel and the same amount of water. A Muir anchor winch and furling headsail are just some of the quality external fixtures of this boat. her on trips to the South Pacific. This unique cruiser is a truly cherished vessel with no expense spared and provides the opportunity for a discerning owner to enjoy a piece of handcrafted Australian heritage.